The Manchester derby on Sunday reminds us how the pendulum has swung to the blue side of the city in recent years, and the graphic below charts the dramatic change over time. Manchester City have only been in the same division as United for 17 of the past 22 years of course – because in the other five years they were playing below the Premier League. But all the league meetings in those 17 years are mapped below, and we have created the chart on the right-hand side of the graphic to show the roller-coaster of respective dominance. The team winning the fixture at each venue is depicted for each season, and the points won in the league derbies each season are noted, and then a three-year ‘rolling’ total of derby points has been graphed. 1: The gap between the two sides when they’ve been in the Premier League for any three straight seasons was biggest at the end of the 1995-96 season when United had won seven straight derbies and all six in that rolling period to lead it 18-0. 2: The gap was next in double figures when United led City 16-1 at the end of the 2010-11 season after five wins and a draw in the previous six derbies. And then the next time it was in double figures was at the end of last season; the pendulum had swung, and City led 15-3 after five wins and one defeat in the six derbies to then. City are on the crest of the rollercoaster ride now. 3: City have won six matches of 17 at home against United in the PL. They have drawn two at home. That leaves nine United wins at City in the PL era. In the last six derbies played at City, United have won three, City two and there has been one draw. 4: City have won the last three derbies they’ve played at Old Trafford. 5: City won just one derby in the first 11 years of the PL, a period in which United did derby doubles over them in three of the six seasons they met. 6: City have won nine derbies in the second 11 years of the PL, five at home and four away. City have only ever won consecutive home Premier League derbies once in the PL era, in the 2002-03 season followed by in 2003-04. Aston Villa made a bright start to the season with 10 points from the first four games but have now suffered five straight defeats and not scored a goal in their last 531 minutes of league football. Now they face Tottenham who they have not beaten since 15 September 2008; that was at White Hart Lane when goals from Nigel Reo-Coker and Ashley Young were answered by Darren Bent’s consolation in the last few minutes of the game. 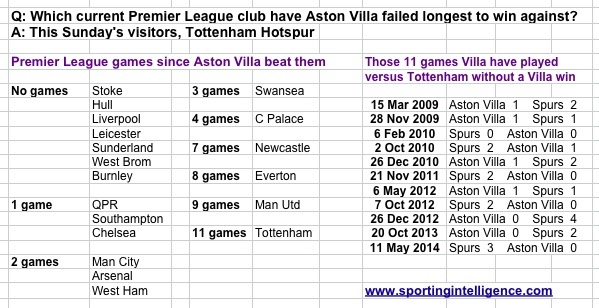 Villa have endured a non-winning run against Tottenham since then that is longer than the non-winning runs against all the other current PL teams, as today’s second graphic shows. 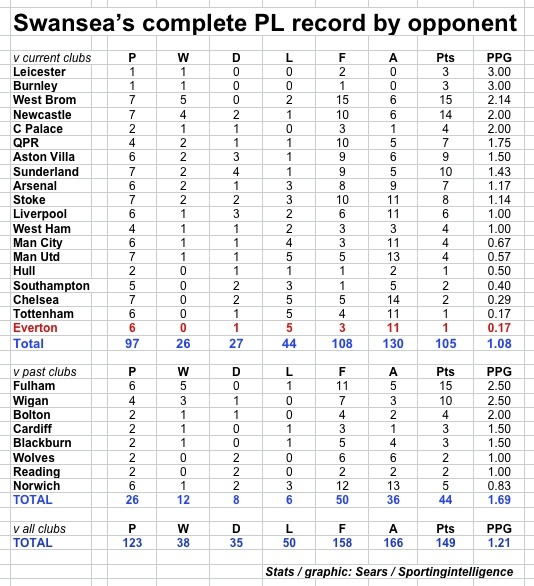 In their four seasons as Premier League residents, Swansea have played 27 different clubs and got at least one draw from each and every club. They have won five of seven meeting against West Brom, and five of six against Fulham, and won four of seven plus drawn two against Newcastle. But against both Tottenham and Everton they have just the one draw and no win in six PL games so far. They play Everton this weekend. Next article "Catterick: ruthless, demanding, never courted popularity. Mr Success"